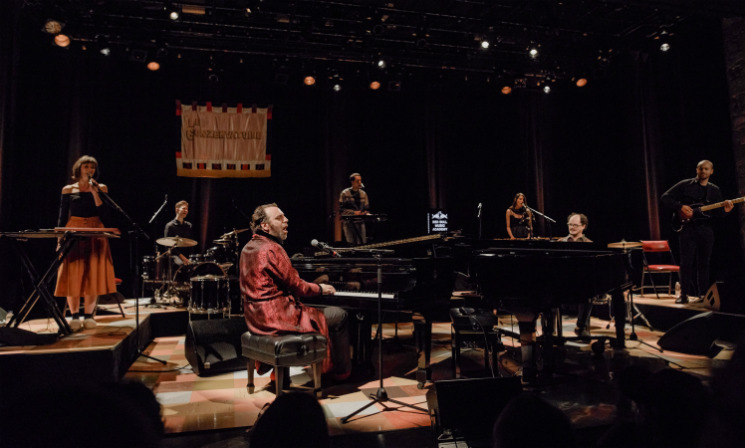 Chilly Gonzales has always been a collaborator, lending his piano chops and charm to artists as esteemed as Daft Punk, Feist and Drake. It's perhaps not surprising, then, that Wednesday's (October 26) Red Bull Music Academy show saw the virtuoso provide his magic touch to a new generation of up-and-coming musicians. Gonzales formally introduced the audience to the "Gonservatory" (get it? ), a crack squad of five intrepid musicians plucked from the halls of the Red Bull Music Academy and given the chance to shine on the big stage. Before we got to meet them, however, he treated us to three of his sublime solo piano pieces including the cascading, introspective "White Keys." When he introduced his first academy member in Toronto native Casey MQ, one was almost sorry to see him relinquish the keys, however briefly. The young musicians performed admirably, for the most part. Casey MQ held his own in a piano duel with Gonzales, while Australia's Angus Tarnawsky and Mathilda Abraham's tracks were promising, if not fully fleshed out. But it was the final two Gonservatory members that really proved that Chilly was on to something. Finland's Joona Samuel's lush and gorgeous ambient soundscapes wowed the audience, while Mexico's Dani Shivers' forward-thinking pop belied her age. At the centre of it all was Gonzales, who served as the vaudevillian host for this madcap, often helter-skelter evening. He was all over the stage, whether accompanying his protégés on keys or plunging into the audience midway through a blistering rap verse. After each artist's performance, they were rewarded with a pair of slippers and a heartfelt, dad joke-laden poem courtesy of their teacher. Apparently this was his first show in nine months, but you wouldn't know it. The industry vet looked and sounded as fresh as ever. The second half of the show took a looser, more laid back approach. Fellow eccentric Socalled joined Chilly and the gang for an hour that featured full-band collaborations and lighthearted jamming. They didn't quite nail it on every song, with some arrangements sounding overstuffed and others lacking structure, but damned if they weren't having fun anyways. Shivers' "Dreams of Death Part 2" was the highlight here, with the young singer shining behind a clapping rhythm and Tarnawsky's jittery shuffle. After the main set concluded, Chilly returned for a solo version of fan favourite "Knight Moves" before inviting random members of the audience to join the Conservatory and participate in the jam to end all jams. The whole thing was kind of a mess, but Chilly's infectious enthusiasm was impossible to not be swept up in. His recruits did their best to keep up, even if they were lacking the magnetism and experience of their teacher. No matter — tonight was about sharing the joy of music and passing the torch.